Provide comfort for the family of Jessica Kroll-Peciulis with a meaningful gesture of sympathy. Jessica J. Kroll-Peciulis age 55 of Chicago, IL and recently of Lake Geneva, WI passed away on Friday, January 11, 2019 at the Mercy Hospital of Walworth. Jessica was born on September 19, 1963 in Chicago, IL daughter of Carmelita (José) Campos and Michael Emil (Julie) Ramirez. She loved to bake, work on crafts and her granddaughters were the pride and joy of her world. She was the loving wife of Peter Peciulis; Mother of Annette Rausch, Amy Reyes, Robert Talbot and Andrew Talbot. Jessica was the proud grandmother of Abigail Schreiber, Victoria Reyes, Anaya Reyes, Celeste Andrade and Elizabeth Talbot. She is also survived by siblings Philip Ramirez, Rachel (José) Crespo, Rebecca (Todd) Luisi, Gilbert Valdez, sister-in-law Maria Ramirez, nieces, nephews, other family members and many friends. She was preceded in death by her mother Carmelita and brother Michael Ramirez. A celebration of Jessica’s life with be held on Friday, January 18, 2018 at the Steinke-Lazarczyk Family Funeral Home (515 Center Street, Lake Geneva) from 4 p.m. to 8 p.m. Steinke-Lazarczyk Family Funeral Home and Cremation Services of Lake Geneva, WI is proudly serving the family. To send flowers in memory of Jessica J. Kroll-Peciulis (Ramirez), please visit our Heartfelt Sympathies Store. 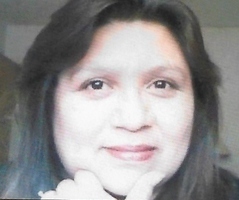 Provide comfort for the family of Jessica J. Kroll-Peciulis (Ramirez) by sending flowers. I am deeply saddened to hear of Jessica's passing and I offer my sincere condolences. I know you will sorely miss such a wonderful presence in your family. In these difficult times, you can find great comfort in the hope for the future present in the bible at Revelation 21:4. This scripture references future conditions on Earth, in which there will be no more suffering or death. There is also a hope found in John 5:28, 29. The resurrection that this Bible verse talks about will give us the opportunity to see our lost loved ones again. I know it would be a joyous time if you could see Jessica's beautiful smile once more! Thanks for the great time when we made easter baskets together with mom. Although mom, end up just watching us do our "magic". LOL. Great memory I'll keep with me. May your rest be as beautiful as God is.